Right and left turning gables. Half & lesser hipped ends. 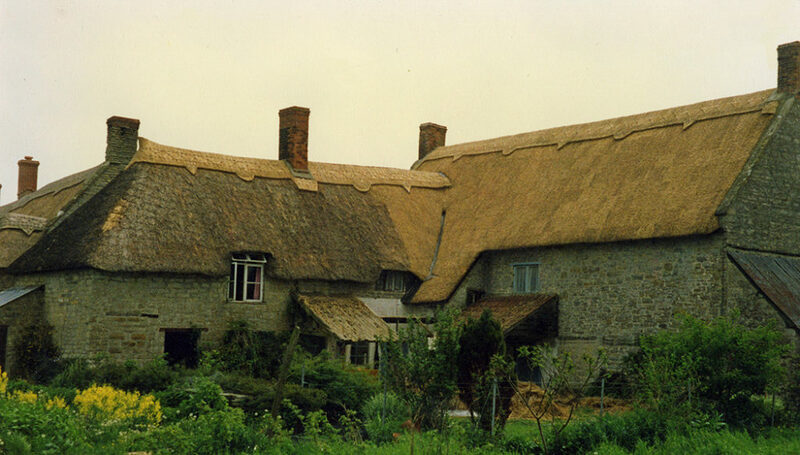 Masterful… When a thatcher can approach such turning roofs, as these; with an easy mind. They will have truly mastered their craft… Top left. 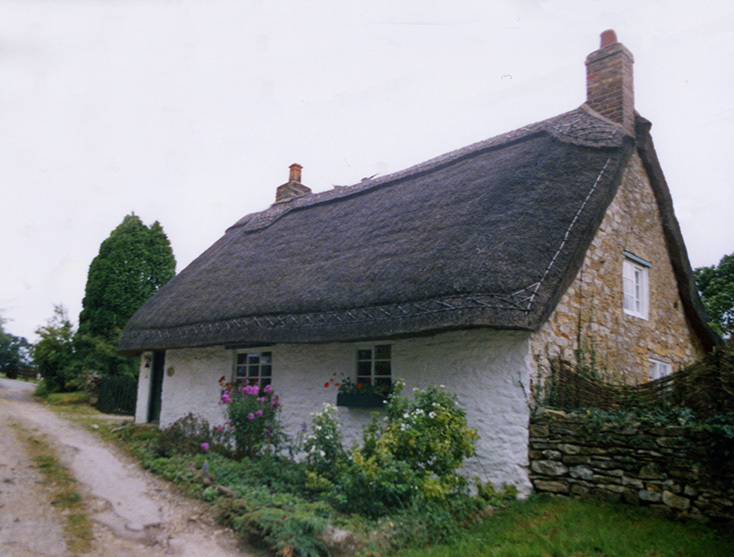 Thatch at Witchampton, in Dorset. Top Right. 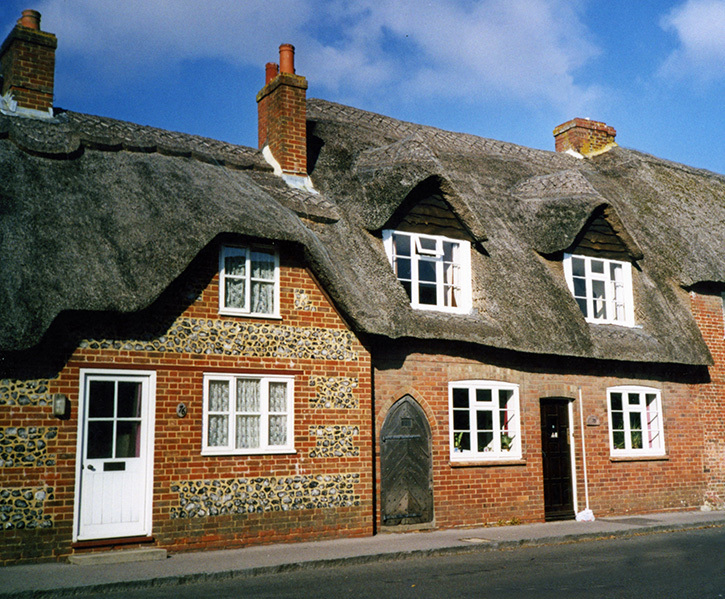 Old Basing, Hampshire; and the school at Somerleyton, in Suffolk. Not so apparent, is the extra ‘length’ hidden in a turning gable… Although the structural roof width remains constant, the thatching does not. This extra ‘length’ is caused by the thatch mostly lying at an angle; of around 45/50 degrees, across the wall edge. With a right hand turning gable, the extra courses are lost, as the thatch gradually straightens back into straightwork. With a left hand gable, extra courses are added; as the straightwork turns into this feature. All this turning requires thatch that has plenty of taper… Except in a valley, turning of any kind is impossible without tapered thatch. Here the small and large ends, created by the long straw thatcher; and the natural taper of combed wheat and fine water reed come into play. Each becoming, in effect, a wedge shaped section; that allows the thatcher to plot a curved course, instead of a straight one. Thus the tops of any thatch have to be narrower than the bottoms; except for the valley… This perverse feature needs exactly the opposite type of material. But more of that anon. Left and Right Hand Tuning Gables… Over the edge. 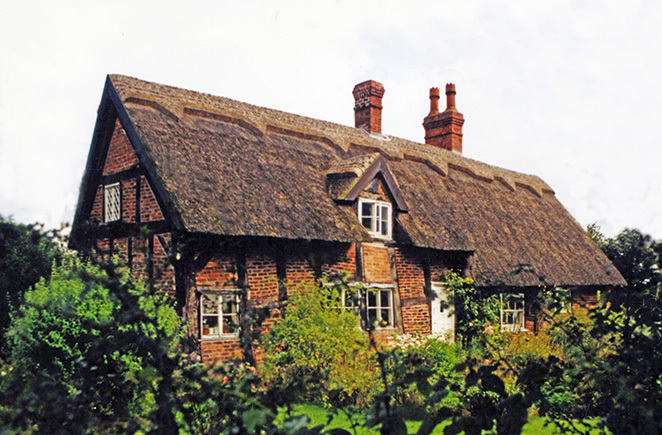 There is more regional variation, to right and left hand turning gables than most other aspects of thatching… The northern and eastern areas of Britain have square, closely cropped ends; here called Barges or Verges. 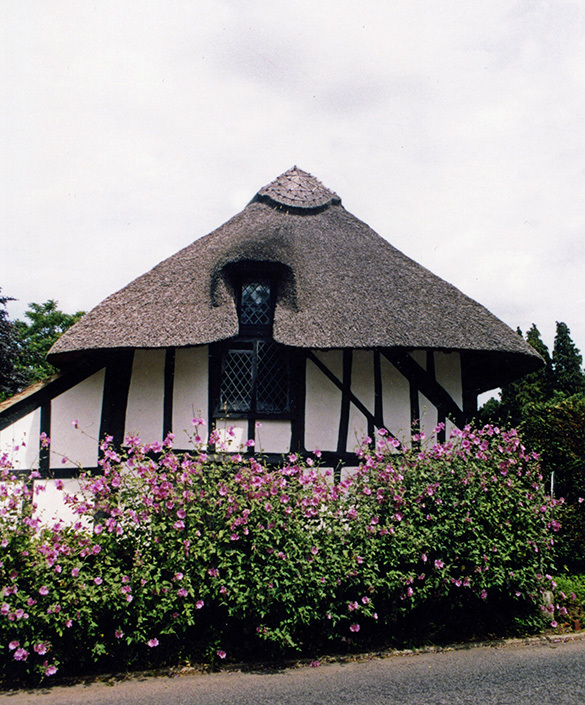 In the west and south, a rounder gable end, with a wider overhang is normal. This seems to have little to do, with the various amounts of rain and wind each area receives and surprisingly perhaps, more to do with the differing folk movements; each area has encountered in the past… This aspect of the craft is looked at in greater detail, on the page detailing Britain’s various thatching traditions. 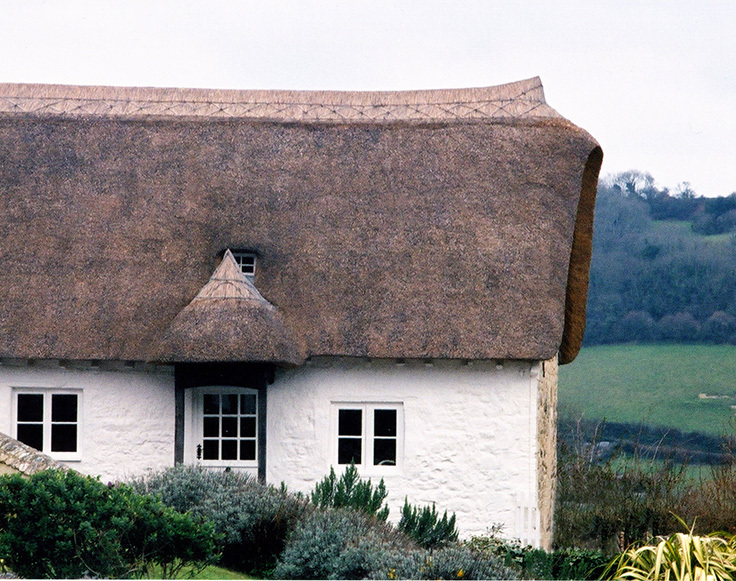 Ends… The top two thatches follow the angular shapes, of the east and north of Britain. Often with a narrower overhang on the gable ends, than the bottom two roofs. These sport the rounder gables of the south and west. 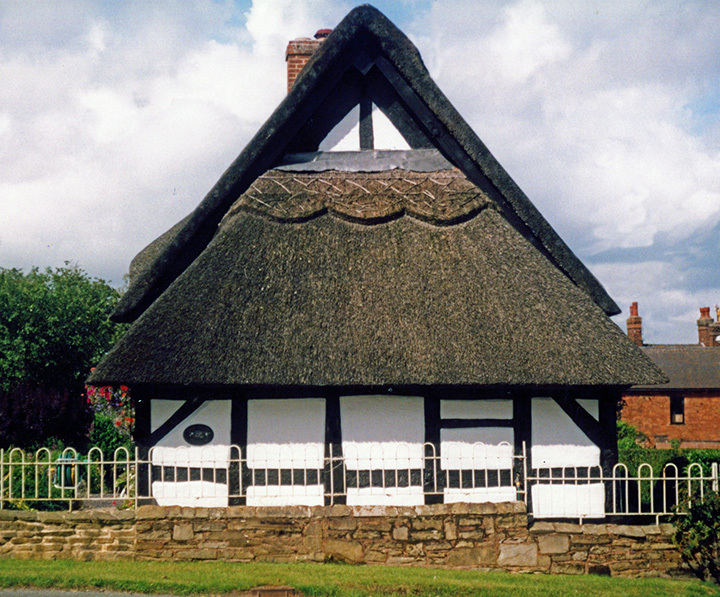 Top left, thatch at Beadlam in Yorkshire. Top right, thatch at Offord Cluny in Huntingdonshire. 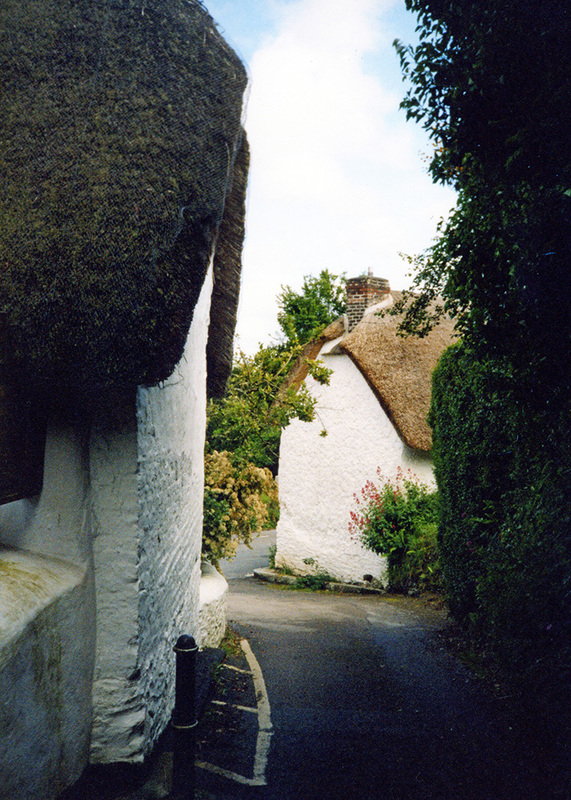 Bottom left, thatch at Branscombe in Devon. 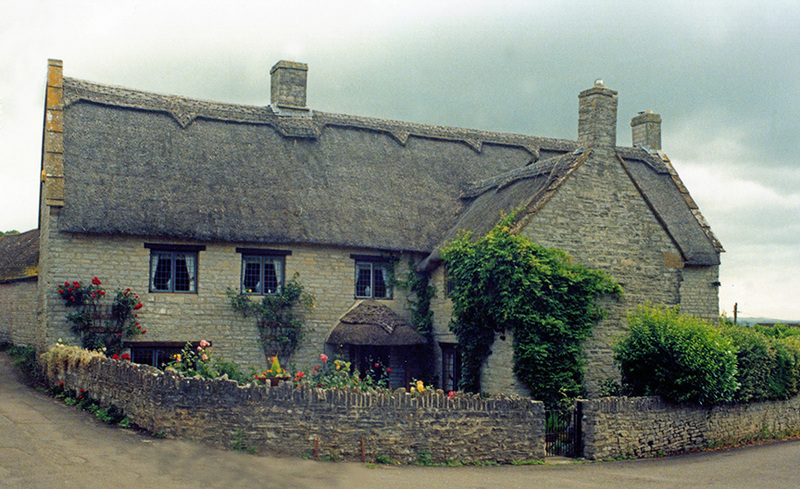 Opposite thatch at Mells in Somerset. Right hand turning gables… The working methods. The right hand edge of the roof is initially treated as an eave. Wadds, bottles or water reed bundles, are all laid and fixed as such. Overhanging the wall by up to 12 inches (300mm). This process should be completed in one go, from bottom to top… When carrying out this process; there is a basic rule to follow. The material, that forms the gable’s edge, should not be allowed to lie at too flat. .0 Wadds, bottles or bundles must be fixed across the gable end, at a 45/50 degree angle; as shown in the opposite image. This has two advantages; both important. Firstly, rainwater will be shed more efficiently, giving extra life to the roof. 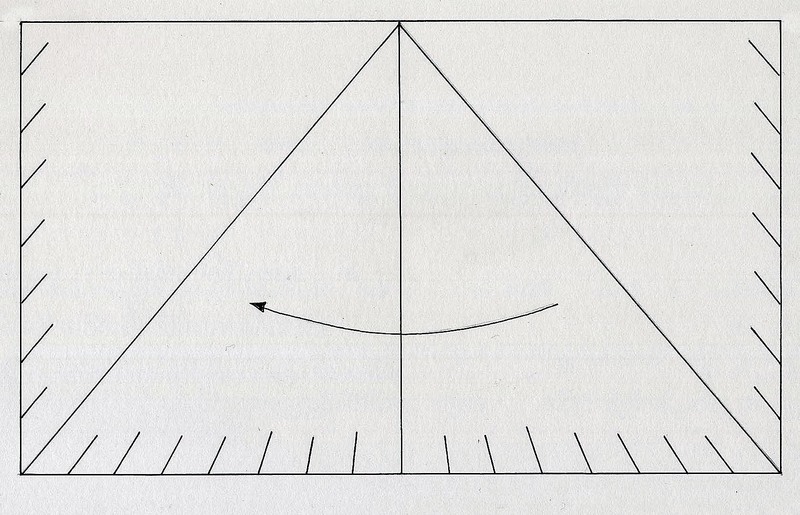 In extreme cases, too flat an angle can draw water into the roof… Secondly, the thatcher will benefit; as a steeper angle will allow for a quicker turn, into the easier straightwork. With the ‘eaves’ course securely fixed, the coating can begin…. Where a gable has little overhang, a layer similar to a brow course, is often fixed, over the material on the edge. This builds up the coatwork quickly to the correct thickness, over the gable wall. With a wider overhang this is not necessary. As the thatcher can achieve the right thickness, with normal courses of work; in the extra space the wider gable provides. On the other hand… The left hand turning gable. Left hand tuning gables… The working methods. 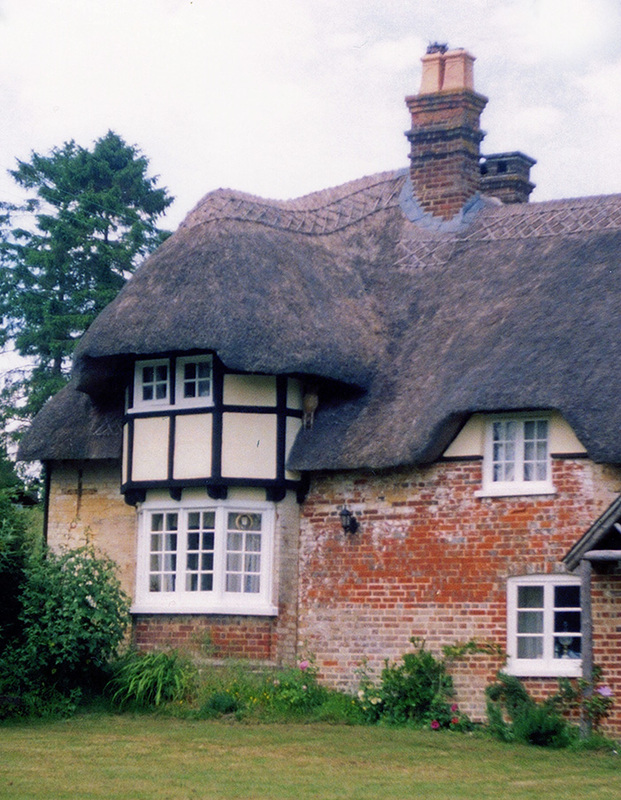 Storm proof gables… Another Beadlam cottage. This one has extra wind resistance; in the form of a wooden plank, fixed through the thatch, into the wall … Once a common sight in this part of Yorkshire. 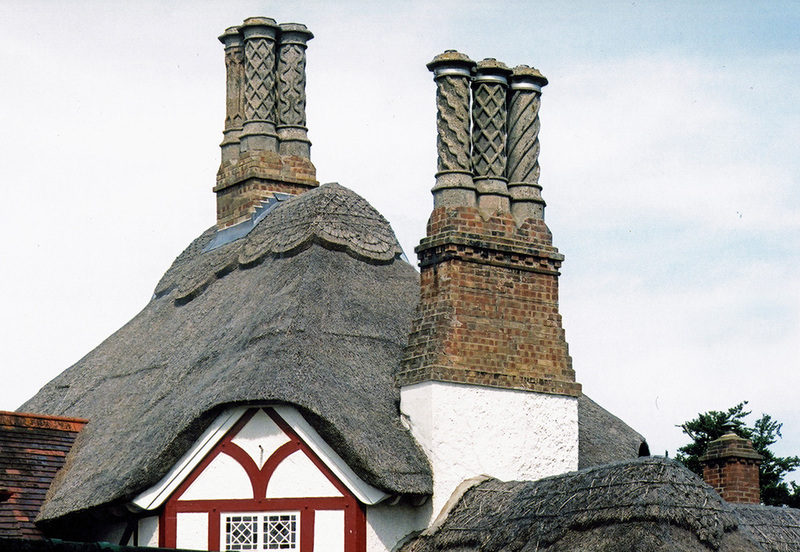 When a chimney sits at the apex of a gable end; and the thatch has either a rolled, boarded or masonry gable, a similar thatching method as the ridge chimney is used. But when the gable ends are turning, to swing out over the wall; a different one is practised. All the turning coatwork, in the gable, under a chimney, will lie at an angle of around 45/50 degrees. The thatcher increases this angle to 90 degrees, just under the chimney; the sides of the courses then lie snugly against it‘s bottom edge… As with a normal ridge chimney, the top two or three courses, then run into the side of the chimney; and these have to remain straight to do so. Hipped Ends… The ultimate feature. 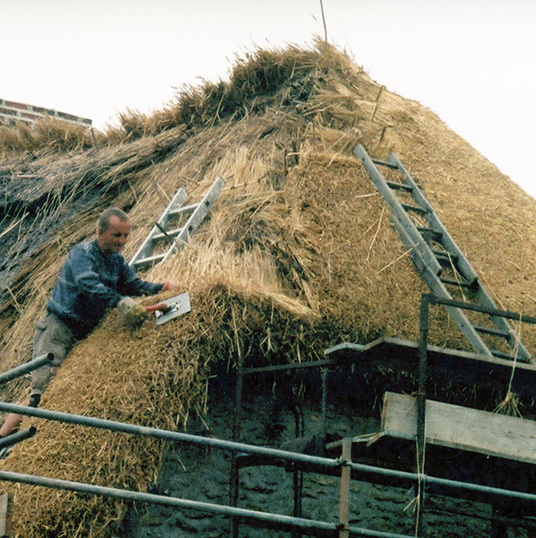 If there were final exams, to qualify for the craft; then the ability to thatch a hipped end would be sufficient to obtain a pass, for standard thatching… These are the most difficult of all features, both turning or straight, to complete. These features come in various sizes. Half hips; quarter hips, as well as the full sized variety. The principals for thatching all of them are the same. Coating hip ends is in effect, thatching around the outside of two corners. Turning the thatch, out to a 45 degree angle, then back into the straight; twice… Combined; as with all turning features, with the addition then subtraction of extra courses. An L shaped building is a little easier, having only one turn. Unlike the gable end, this feature has no stout wall along it’s length to fix into. Thus hips can be vulnerable, to both meteorological and avian depredations; unless thatched correctly. 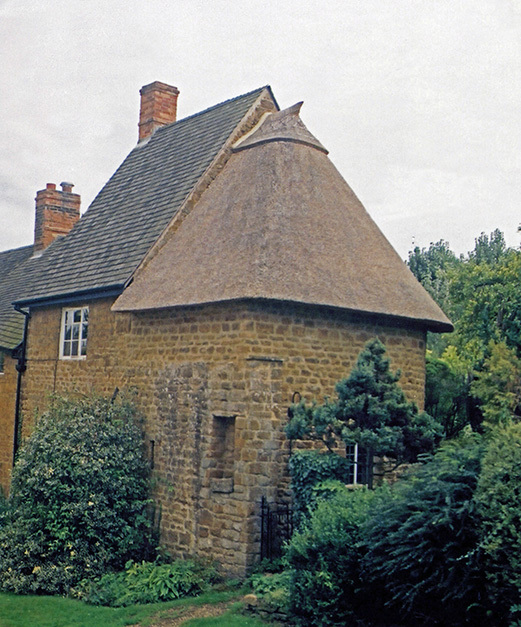 Hips… Fortunately for the thatcher, roofs that consist of nothing but hips; like the above thatch, are rarely seen. 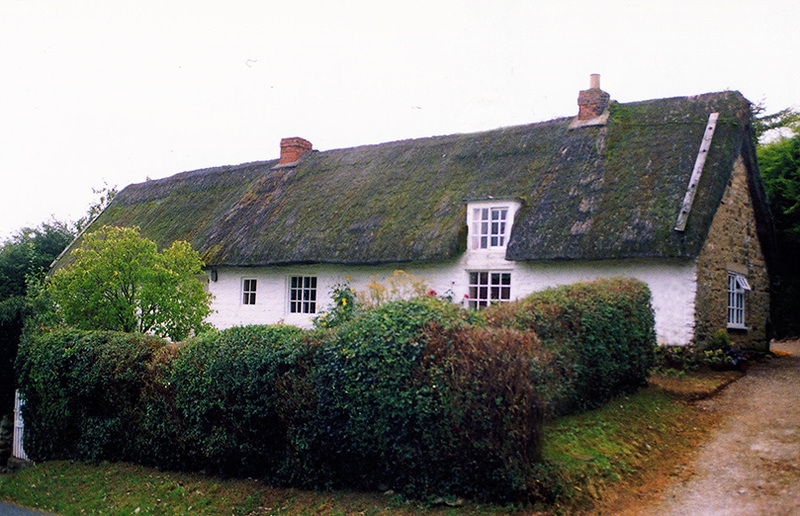 But demanding full hipped ends; like the immaculate thatch below left, are common enough. As is the half hip below right… Above roof at Gittisham in Devon. Wroxton, in Oxfordshire bottom left. And Ecklington in Worcestershire on the right. Hip ends … The working methods. 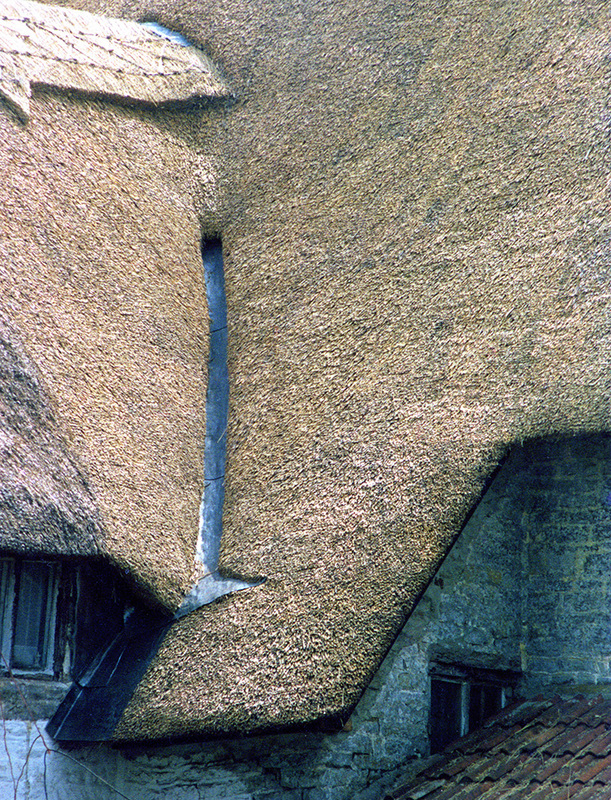 The principal, that the length of the thatch used, is the minimum space required, to turn to a 45 degree angle; can allow the bottom of this feature to be broken up, into areas of straightwork and areas of turning. The larger the hipped end the better, as the proportion of the turning area lessens; as the amount of straight work increases… But the upper part of a hip consists entirely of turning coatwork. Here, once the centre of the hip is reached, the thatch immediately starts turning once more. Up here is where the use of good tapered material is essential; the water reed thatcher especially, needs fine tapered bundles. 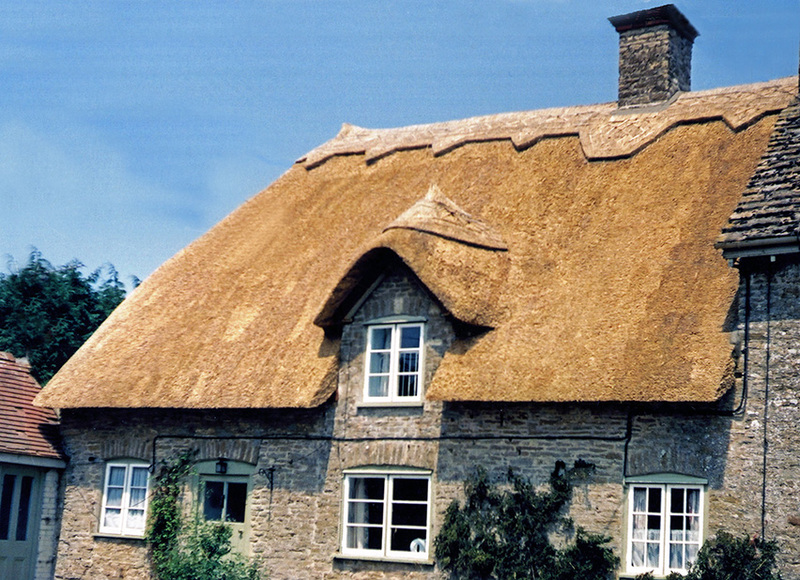 To thatch this feature; the thatcher typically brings the coatwork, to within around 12 inches (30cm) of the hip corner. All the courses should now have turned, to a 45 degree angle; with extra courses having been added, as required. With this fixed, the courses on the hip elevation itself, can now be laid. By the time the centre of the hip end is reached, these should all be straight… At the centre of the hip end, all the extra length has been lost. All the courses are continued; gradually filling to full size once more, as the second hip corner is neared. The process is then repeated, for the second hip corner. The top two or three courses, are often brought around the whole feature in one go, as the thatcher can reach across this small area easily. Although the above work sounds more complicated than difficult, the skill lies in knowing exactly how much material, to add and subtract, from the courses. Also the 180 degree turning shape, has to be followed accurately. Full hips… If large enough, a full hip will contain enough straightwork in it’s centre section; to allow small straight features, such as windows or eaves chimneys to be inserted. As seen on this very attractive hipped end, at Lingfield in Surrey. A half hipped roof consists of a gabled end and hip, in roughly equal proportions. A quarter hipped roof is around seventy five percent gable end. Even smaller hiplets, often lie on top of a gable wall. As turning features fit well together, partially hipped roofs create no extra problems for the thatcher. A half hip, almost finished… With the second gable complete, the second hip is turned. Firstly, by converting the hip eaves course, back into a normal one. Right; a completed job; at Downton in Wiltshire. 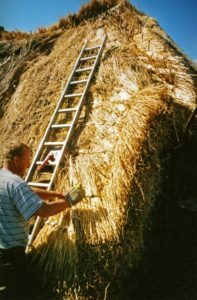 Variations… As with all thatching features, there are countless ways, a hip roof can occur; some being easier to cover than others. 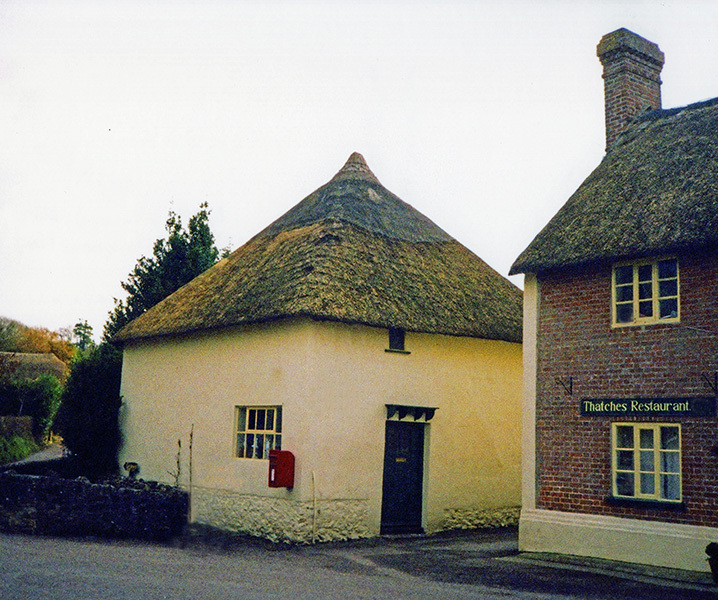 Left, thatch at Chislett in Kent. 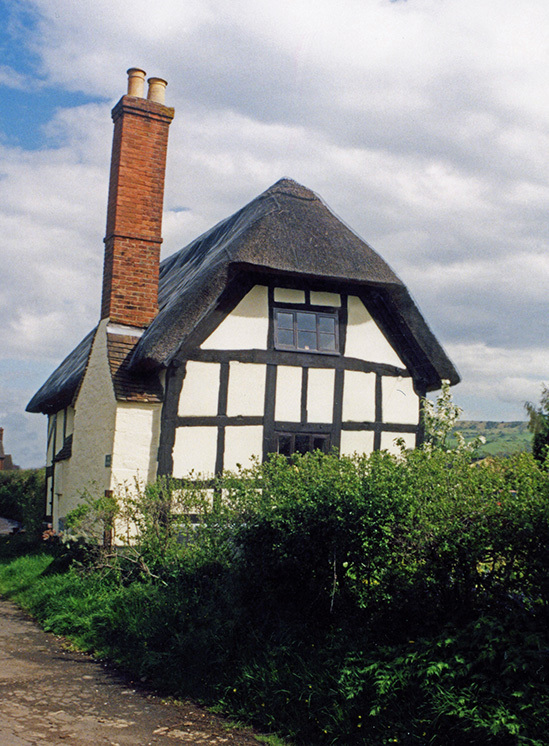 above, thatch at Stowe by Chartley in Staffordshire. Right, village pump at Fontmell Magna in Dorset. Valleys… Thatching turned upside down. Valleys are quite a common feature. Many properties have been built or extended over time; to form either a L or T shaped plan. 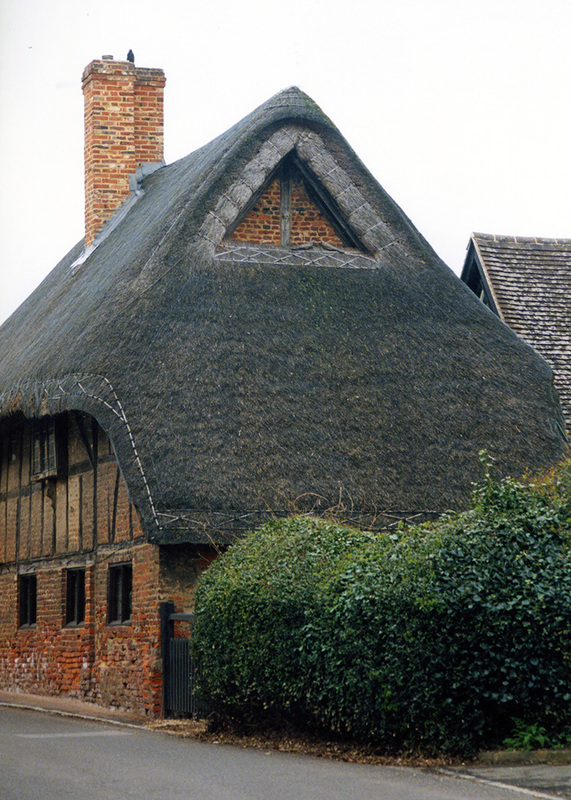 Thus having one or two valleys to maintain… This feature is also a part of many windows; often too large to thatch with straightwork. A drawback, with standard coated valleys, is that they will almost invariably wear out before the main coatwork… Thus other methods of completing this feature have also evolved. When two roofs join… Valleys both big and small are created. 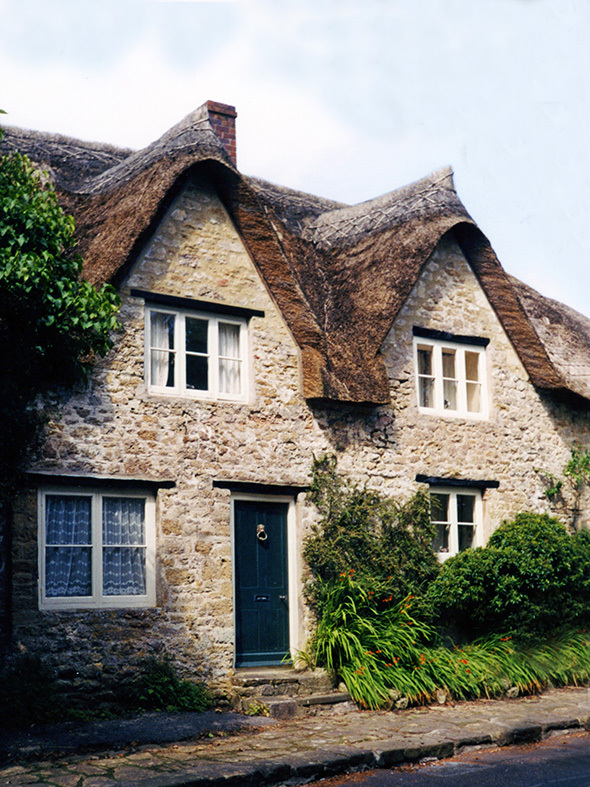 Right thatch; Kingsdon in Somerset. Left thatch, Stalbridge Weston in Dorset. Standard coated valleys…The working methods. In common with the other turning features, extra courses will need to be added, then subtracted; in a similar way to a hip, as this feature is completed. As the middle of the valley is approached, the courses should gradually turn to follow it’s centre line; as the opposite image shows. As the thatch turns, great care must be taken, to counteract the trend of the thatch to get flat… Thus extra material is needed, above the line of fixings. 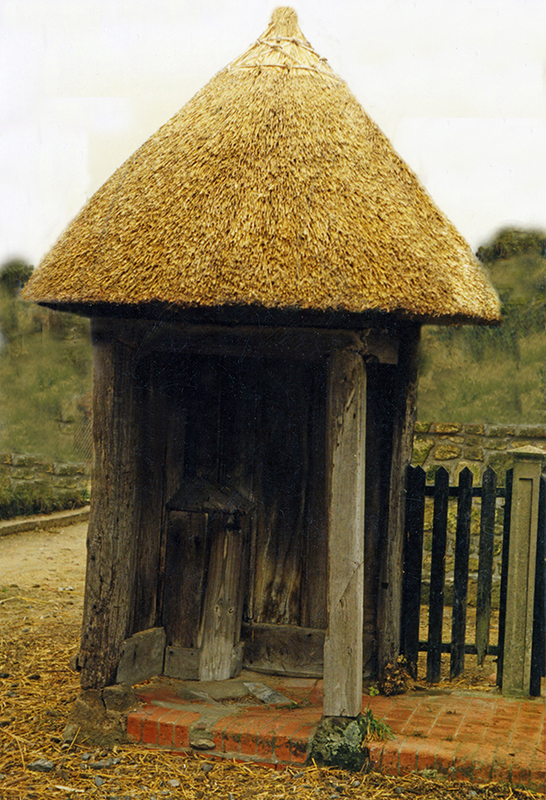 This is added in several ways, depending on what type of thatch is in use. The long straw thatcher has the great advantage, of using a material that can be used either way around. By turning the yealms upside down, so the small end is at the bottom; a great deal of extra top bulk can be provided. However, even with this method, some backfilling may still be needed; to make the coatwork steeper . 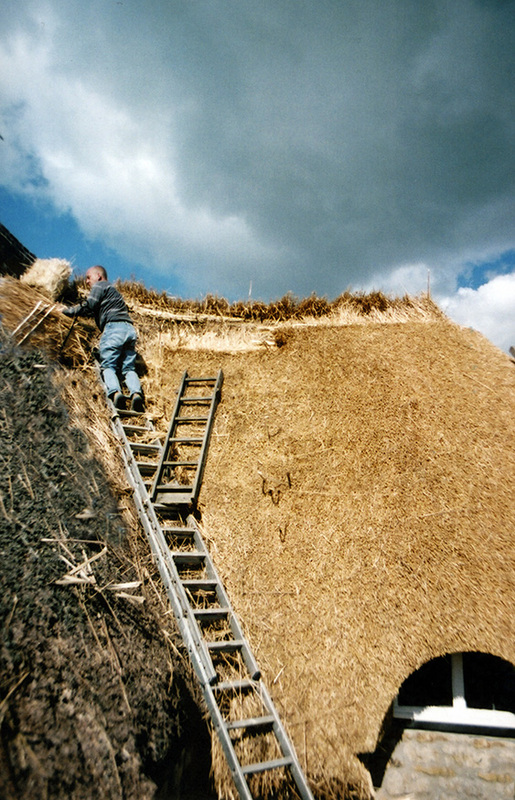 Having ensured the thatch lies as steep as possible in each course; it is good practice, to sweep around the centre of the valley, creating a curved rather than a sharp shape. This will help to spread both water and wear. Most thatchers of a certain age; will have worked on properties, with layer upon layer, of corrugated galvanised sheeting in the valleys… This sheeting forms a gully. These have two benefits. Firstly, all the water, carried by the thatch in the centre of the valley; is shed by the gully. And secondly, the pitch of the thatch, on either side of these valleys, remains the same as the main roof; in theory making the valley last as long as the rest of the thatch. Or until the sheeting rotted out… then another piece was slid in on top. There are still a few of these to be found, but lead sheeting is now more commonly seen, being much neater and permanent. These gullies can be the cure, to the worst positioned of valleys. They do not have to run the full length of the roof. Often only the bottom half, or third section of a valley, needs some extra help. On bare timbered and multilayered roofs, the lead sheeting, will need some wooden boarding to sit on. On multilayered roofs, this boarding can lie on the old underlayers, but must be fixed properly to the wallplate. 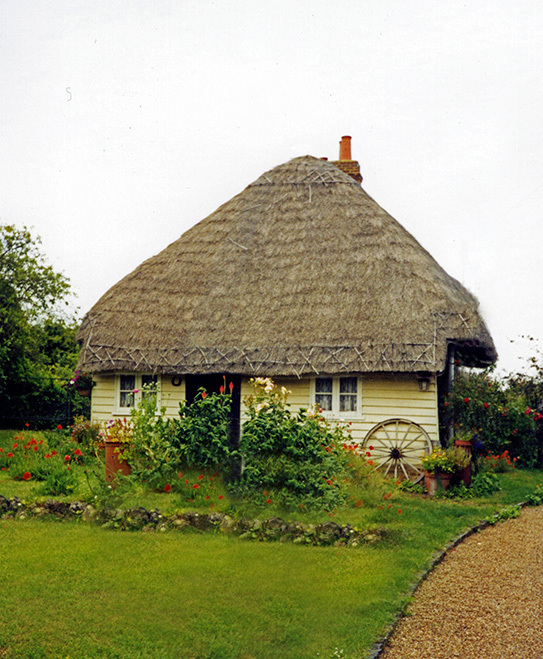 The total width of the boarding, will need to allow for the thatch to overlap, by as much as an eaves, on both sides and leave a narrow gap in the centre. Around 3 feet or a metre in width, is usually sufficient. An upstand, on each side, is then created; to stop any water running off the edges of the gully. Often a 3 inch (75mm) arris rail, is used to good effect for this. The lead is then dressed and fixed over this timber base. The boarding and lead will need to extend over the wallplate, to shed water away from the property. This type of valley allows for a box gutter, to collect the water and take it straight to the ground. 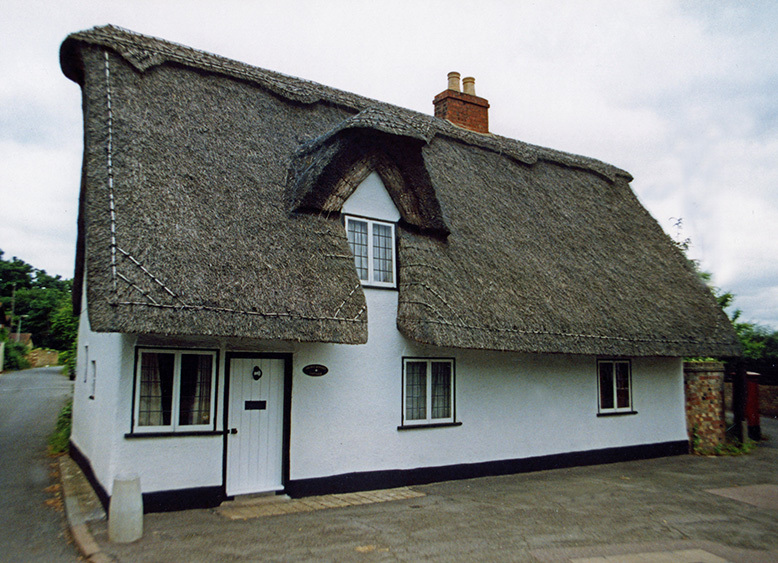 If this is not preferred, then the lead should extend out, to match the thatched eaves, on either side of it. Once the lead has been fixed, the thatcher can proceed… The sides of the gutter are treated as an eave; wadds, bottles etc. are fixed, to leave a gap of around 4 inches (100mm) in the centre of the lead sheet. This gap helps stop the build up and allows for the easy clearance, of any rubbish that may accumulate over time. On the right hand side of the gutter, the courses remain as straightwork and are faded out, as they reach the lead. The left hand side sees the courses start again,gradually thicken and continue out of the feature. Above the lead sheeting, whatever the length, the roof is treated as a conventional valley. From a distance… A lead valley properly fixed, hardly shows. Even less so, when the new coatwork tones down. 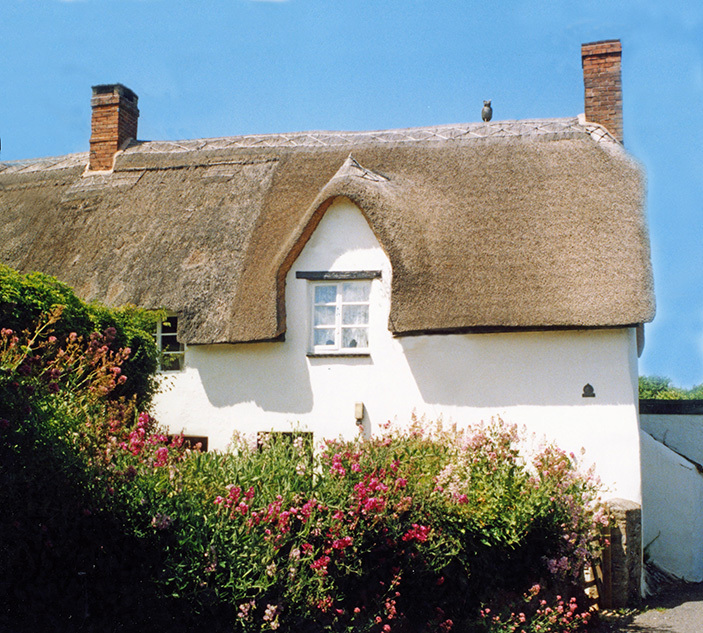 Thatch, near Queen Camel in Somerset. Turning Eyebrow and Dormer Windows… Turning on the straight. With this type of window construction, the thatcher has a combination of several turning features to cover; usually in a small area of roof… But these windows are not as difficult as they look. The rule that features from the same group, sit well together applies here. Once the thatcher has turned the coatwork into the valley at the sides of the window, the angle of turn is then maintained; straight into the gable or hipped end; at the front of the window. Making this feature relatively straightforward to thatch. These features have the advantage, of keeping the roof pitch steep over the window; a failing found in some straightwork window construction. But a lesser problem is created, as the window’s ridge joins into the main roof… The answer to this problem, is examined in the next page. One or many… Turning eyebrows. The top cottage, with a straight boarded gable end; only makes this feature a little more difficult; than windows having turning gables. 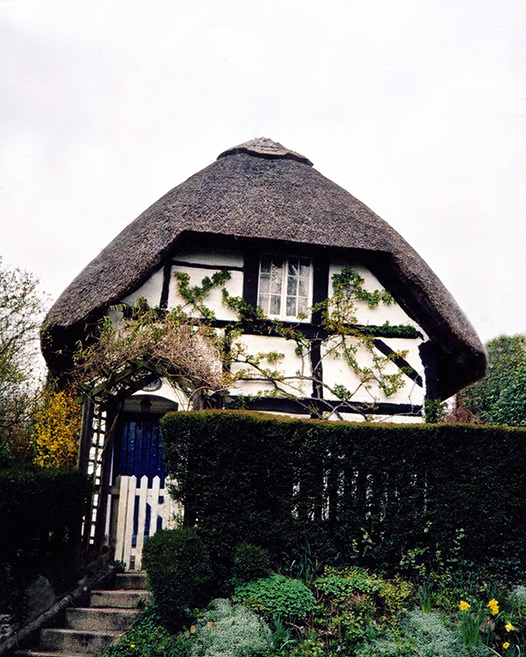 Which is just as well, as the bottom roof has seven to contend with… Top thatch, at Colemere, in Shropshire. 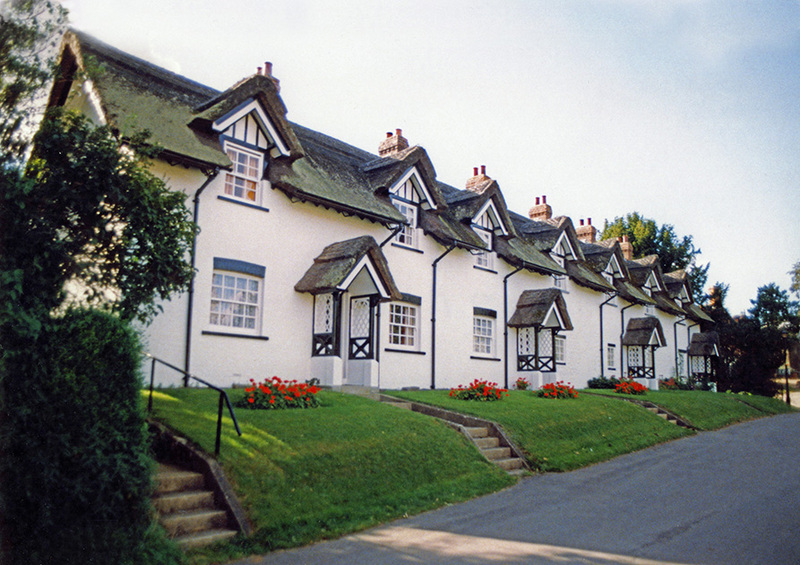 Lower thatch, at Warter, in Yorkshire.